My Aunt Norma was incredulous when she learned that I had gone my entire life without tasting buttermilk pie. "Oh, Cheryl," Norma said, "You have been deprived!" She blamed my mother for the fact that buttermilk pie had never entered my digestive system. But then, I think there's been a bit of friction between Norma and my mom ever since that "Ferris wheel incident" which had occurred sometime in the 1940s. So anyway, about 15 years ago, after spending a day raving about them, Norma baked a couple of pies. And they were delicious. However, I've not been offered buttermilk pie since then, so, I've spent the last 15 years in another dark period of deprivation. 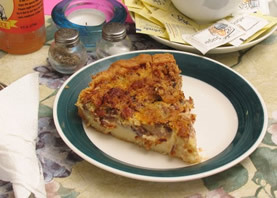 In early April, while Dave and I were in Paxico, Ron Etter, co-owner of the Electric Cat Café, mentioned that their signature pie was buttermilk pecan. that it wasn't the gooey kind of pecan pie you get at Thanksgiving and that it didn't really taste like buttermilk. "I've told people that if they don't like it, I'll give them something else," Ron said. "And no one's ever taken me up on it." There was really no need to convince me. I owed it to my Aunt Norma to eat buttermilk pie whenever the opportunity arose. crust of pecans on top. Now, I'd say it's worth the trip to Paxico just for the pie, but the town offers more than dessert. The Electric Cat also serves quiche, salads and sandwiches -- including vegetarian and vegan options. 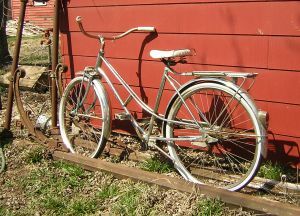 Situated along Interstate 70 in Wabaunsee County about 20 miles west of Topeka, Paxico has a cluster of antique stores. Seven of them, I think. Mill Creek Antiques is one of those shops. This business stretches through the interior of several western-style buildings on Newbury Road. In Mill Creek Antiques, one room in the store features old wood-burning stoves and kitchen ranges. And in a shop toward the back, the business restores these antique household fixtures. "This must be the old-stove capital of Kansas," I said to the co-owner. "It's the old-stove capital of the world," Kathryn Hund said with a smile. As Dave and I walked around Paxico, my pulse rate relaxed and I felt each breath deepen. The casualness we encountered matched the beautiful spring weather that day. Every person had a smile and a pleasant word. Back at the Electric Cat Café, Saturday afternoons mean "Kansas Stories." Dave and I had pulled into town just as the Harveyville Pluckers were putting away their instruments after giving an outdoor concert on the "cat" porch. But soon, Betty Wilson put her fingers to the piano keys and began playing and singing songs such as "Dixie," and "Home on the Range," and "Happy Days are here Again." The piano was discordant and it no longer responded to tuning, according to Ron, but that didn't matter a whit. We were all just along for the glorious ride. Linda Geffert, co-owner of the café, and Janice Levering told "Kansas Stories" about the orphan trains that had originated on the East Coast. From 1867 to around 1930, trains carrying orphans stopped at various towns in Kansas. Between 5,000 and 6,000 children found new homes in this state. As we sat in the restaurant, listening to music and storytelling, it felt as if Dave and I were in the presence of old friends. Warm fresh air blew through the screen door at the cafe, and in one clear moment, I remembered that life was pure and simple and easy.